Electrosound supports tour celebrating the 25th anniversary of her breakthrough album with LR18 pro-ribbon arrays and BF362 subwoofers. Swedish singer Lisa Nilsson is currently celebrating the 25th anniversary of her breakthrough album Himlen Rund Hörnet (Heaven Around The Corner) on a 31 date Scandinavian tour. 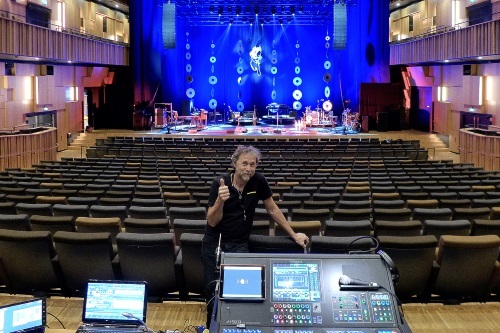 With songs ranging from up-tempo pop and dance to soulful ballads and jazz, front of house engineer and audio production chief Brollan Söderström chose Alcons Audio pro-ribbon loudspeakers to bring the wide dynamic range of the songs to the enthusiastic audiences. Playing theatres and concert halls of up to 2000 capacity, Lisa is fronting an eight-piece band comprising drums, bass, guitar, saxophone, two keyboard players and two backing vocalists. As the owner of Swedish rental, sales and installation company Electrosound AB, Brollan is a long-term Alcons pro-ribbon user. 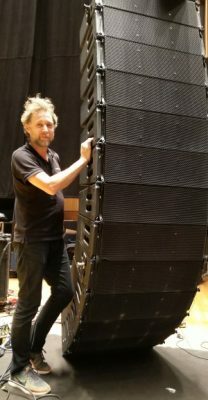 Having invested in the LR18 compact mid-size line array for Electrosound’s rental stock, he knew that it would be the ideal solution for this tour. The system comprises 32 LR18 with six BF362 high output subwoofers (in a two layer, end-fire configuration), plus four SR9 compact in-fill monitors for fills and two QR36 modular line-source array columns as extended frontfills. On stage, seven VR8 compact and three VR12 mid-size versatile monitors are used as wedge monitors, alongside an in-ear system. The entire Alcons system is powered and controlled by six Sentinel10 and two ALC4 amplified loudspeaker controllers, with the show mixed on a Roland M5000 system. One of many benefits of using the LR18 on this tour is that it is compact enough to fly in every venue. All have installed house systems so Brollan needed one which would deliver optimum sound and maintain audience sightlines, where installed systems are already taking up space. Equally important for Lisa is the quality of her monitoring, which is why Brollan selected the VR8 / VR12 combination. “Because the monitors use exactly the same pro-ribbon technology as the main PA, Lisa is hearing a non-compressed, 1:1 reference of her voice. She knows the audience is hearing exactly the same as she is, making it a perfect interaction between the monitors and Front of House system,” he says. To take maximum advantage of the Alcons system’s audio quality, Brollan specified 16 channels of AES42 digital condenser microphones – Neumann digital KMD105s on all vocals and a mixture of Neumann KMD-143, 184, 185 and TLM103D instrument mics. He continues, “I have been doing this since 1980-81 and, in that time, I have heard a lot of systems. Alcons pro-ribbon systems are unique in that the sound ‘pops out’ of the box without hurting you. I have to run other systems 5-6dB louder on average. And, of course, with a pro-ribbon system there is less distortion, you can have a high, clear midrange without it sounding irritating.